As a kid, I never liked pork chops. Mostly since pork chops were always so tough and dry. It didn't really matter who made the pork chops, they were always so dry since the theory back then was that pork chops HAD to be cooked all the way through. Not anymore! Turns out that pork chops are rather tasty when they aren't cooked to death. So now that I'm adult I can enjoy pork chops, I hope my pulled pork recipe doesn't get too jealous. Is there anything better than cooking a piece of meat in a wine sauce? Of course there is - a garlic wine sauce! And these pork chops are not for people who are who are not garlic lovers. Just in case you want to scare a vampire away, this is the dish for you. Full disclosure, I don't make these for my kids. I think they would eat them, but this is a date night meal for Brett and me so I've never made it for them. 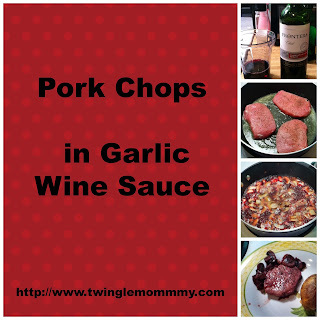 First thing you'll need is to pick a good red wine to put in the sauce. One tip for those of you who do not cook with wine often, you must cook with a wine that you like to drink. I know it's tempting to buy cooking wine or the cheapest bottle you can find but don't do it. Your food can only taste as good as the wine you put in it. That is not to say that there are not great inexpensive wines out there. I made this dish with Frontera Cabernet Sovereign/Merlot which retails for $5. That is a great price and it tastes great too! 1. Heat oil and 1T of butter in a skillet over medium/high heat. 2. Season pork chops with salt and pepper. Sear both sides 1-2 minutes, depending on thickness. You want to get a nice brown color on them. I have three pork chops since they were thinner than I usually use. 3. Reduce heat to med/mow and remove pork chops to a plate and add garlic to the skillet. Brown the garlic on all sides without burning it. 4. Add remaining tablespoon of butter to the skillet and melt. Add sliced mushrooms and saute. 5. Add red wine and bay leaf. Simmer until the sauce reduces by half. Do not rush this step, it's very important. 6. Remove garlic and add beef broth and pork chops. 7. Chop the garlic, This is optional, you can keep it whole but I like it chopped up. 8. Add the garlic to the pan and keep your eye on the pork chops, they'll be done very quickly. 9. 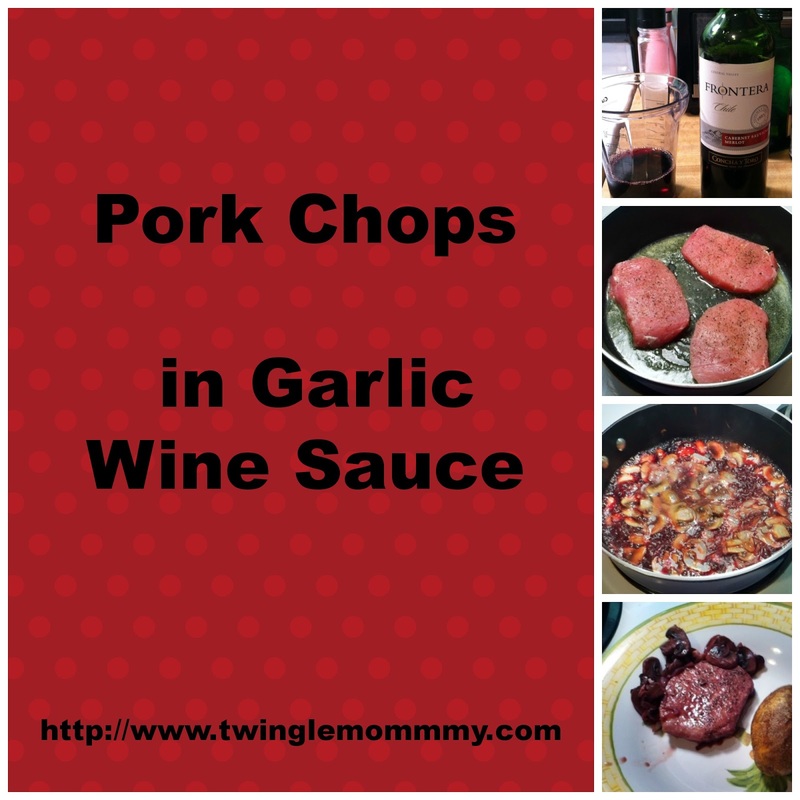 Plate the pork chops with a little wine sauce over it. I serve the extra sauce on the side for dipping. We are really fancy that way! I left my husband in charge of the pictures, that was a little mistake. Trust me it tastes good. These are a hit in my house and I hope you'll like them too. They went perfectly with the baked potato and salad! And the next time you're at the store check out the Frontera wine. They have a great selection including Pinot Noir and Moscato which seems to be the new "it" wine! Disclaimer - I received a rebate to try the Frontera wine. No further compensation was provided and all opinions are 100% mine. New GFC follower. Thanks for stopping by my blog earlier. What a great way to take pork chops to next level. Can't wait to try this recipe!